Sacrificing your queen to win a game is always fun. But how about giving your opponent a second queen, and still winning? This was what happened in a 4NCL game played by Chris Skulte earlier this year. In a hard fought game, Skulte managed to get a clear advantage around move 40, but the knockout blow happened on move 51 with Bf4. This allowed his opponent to promote his c pawn a few moves later, but by then, it was all over, as Black had a forced mate. I was doing some chess study with a friend this morning and he showed me a position from one of his games (A Morra Gambit). He was interested in my assessment, as he felt he was better during the game, but couldn't find the right followup and went on to lose. We applied some rudimentary positional assessment to the position (king safety, material, pawn structure, space, central control, open lines etc) and came to the conclusion that White was better (despite being a pawn down). But it is one thing to assess the position, but another to then use that assessment to come up with a plan. In the actual game 15.Bb5+ was played, which isn't a bad move. Black played 15 ... Kf8 (15 ... axb5 16.Nxb5 is crushing) and White is still better. There were two other moves we also looked at, which I categorised as the 'Tal/Nezhmetdinov' move, and the 'Fischer/Capablanca' move. 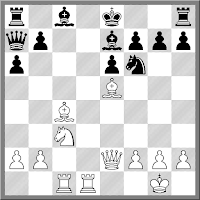 The tactical try was 15.Nb5 with the idea of playing Rc7 after 15 ... axb5 16.Bxb5+ Kf8. The positional try was 15.Ne4, exchanging off a defender, and opening the position further. 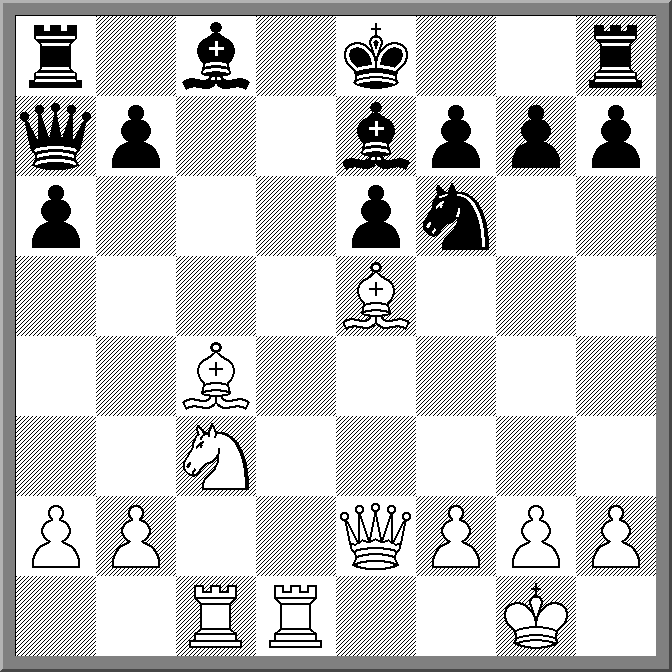 And according to the chess engines, it is 15.Ne4 which is the strongest move in the position. The assessment is +3 (and a bit) for White, which indicates that a tactical win isn't that far off. Nonetheless I was still surprised by this. I guess it shows that even if you can recognise the strength of a position, you still still need to find the winning moves. The 2018 Sinquefeld Cup has ended is a slightly confusing three way tie. Wins by Aronina and Carlsen enabled them to catch Caruana at the top of the leader board, on 5.5/9. There was then supposed to be a playoff between the two players with the best tie-break, but the high proportion of draws meant that they all had equal tie-breaks. Eliminating one player by the drawing of lots didn't appeal to Aronian and Carlsen, so the playoff was dropped. It then turned out a playoff was needed, but to see whether So or Caruana qualified for the Grand Chess Tour final in London. So these two will be playing overnight to see he is the 4th player in the final. While Aronian's win over Grischuk was a bit of a bluff that paid off, Carlsen continued to heap misery on Nakamura. Forcing Nakamura to defend a weak pawn for a lot of the game, Carlsen found a clever king march in a rook and pawn ending to force Nakamura's resignation on move 97. This was enough for Carlsen to grab a share of first, while pushing Nakamura into a tie for last place with Karjakin. Due to a lack of interested parties, the Australian Chess Federation has awarded the hosting rights to the 2019 Australian Open to the Box Hill Chess Club in Melbourne. Oddly the dates for the 2019 Open will be from the 27th to the 31st of December 2018. Ordinarily the Box Hill Chess Club would be hosting a 7 round swiss from the 27th to the 30th, but have decided to add on 2 extra rounds to make it a title event (albeit a shortened one). As a previous organiser of the Australian Open I find this decision sad, but at the same time, hardly surprising given the ACF's track record at attracting tournament hosts. Weirdly, the very tournament that has now become the Australian Open, was originally organised in direct competition to the 2006-07 Australian Open in Canberra, on the grounds that Victorian players weren't interested in playing in Canberra at that time of year. I'm guessing the organisers hope that the rest of the country won't have the same attitude towards Melbourne. Despite the application of rules designed to discourage draws, the 2018 Sinquefeld Cup has seen plenty of them. After 7 rounds, there have only been 6 decisive games, a win rate of a little over 17%. The big clash for round 7 was the Carlsen v Caruana match-up, as it was the last time they would meet before their World Championship Match. While the game ended in a draw, both players looked as though they could take something from it. For Carlsen, he gained a clear advantage against an opening that Caruana may use during th World Championship, while for Caruana, he would be happy that he was able to defend a worse position. Caruana still holds a narrow lead, having won 2 games and drawn 5, while there are 4 players tied for second, all with 1 win each. The 2018 Chess Olympiad starts in a little under a month. Official registrations have closed, and at the time of writing this 183 teams are registered for the Open, and 150 for the Women's section. USA is the top seed for the Open, ahead of Russia and China, with Russia, Ukraine and Georgia heading the Women's event. Australia is seeded 42nd in the Open and 33rd in the Women's. PNG is seeded surprisingly high at 149 in the Open, located among traditional rivals such as San Marino, Guernsey, and Bermuda. The current list of teams is here, noting that the team lists do not have the players in board order. Before Steintz became Steintz, he was one of the many masters looking to follow in the footsteps of Paul Morphy. But he had plenty of competition, with players like Blackburne and Bird also playing in a similar style. As a result, matches between these players were often exciting affairs, with sacrifices and combinations deciding. The 1866 match between Steinitz and Bird showed this, with Steinitz winning +7=5-5 (9.5-7.5). Sometimes you sit down at the board and decide a draw is the right result. This can happen during the game, or in the case of the following game, this decision can be made 20 years ago. For those unfamiliar with the back story, Ian Hosking and I have debated the soundness of the Traxler since 1985, and while the score is strongly in my favour, recent results have not been so kind to me. So when we reached move 15 Ian offered me a draw, knowing that I could take a perpetual if I wanted to. After about 30 seconds though I accepted the offer, as I didn't spot anything clear cut. But some advice for those who wish to follow the same path that we did. If you are Black, refuse any such offers, as the position is actually winning after Nd4 (a move I did consider BTW). I leave the actual analysis to you and Stockfish if you are interested. The 2018 Sinquefeld Cup is underway, although the early morning viewing start (4 am) is a bit tough for Australian viewers. On the other hand, if the games do run long enough, then there is the chance to catch some action. For example, when I woke up at 7am the Carlsen Karjakin game was still going, although the position seemed pretty equal. I then ran a few errands, but when I got back, the position was still equal (although Carlsen had saced an exchange for 2 pawns). I then took the dog for a walk, to return to an still equal position, although Carlsen was now pushing hard for a win. And finally, by the time I got back from chess coaching, Carlsen had won the game, because Carlsen is Carlsen. Whether Carlsen decides to do this to the rest of the field I'm not sure, but if he does, I for one will enjoy watching it over a cup of coffee and the morning crossword. Flipping through some old games I came across this quick win in the BDG. While I don't go looking to play the Blackmar-Diemar Gambit, it is something I will play against the Scandinavian. In this game Black went wrong on move 6, as after I castled, the open e file was always going to be a problem for him. On the other hand, a different set of issues arrive, when one school is clearly stronger than the rest. In both Secondary Schools events this year, the top three places were taken by single schools (Canberra Grammar and Lyneham High). It also made the event tough on the other players, as the leading players couldn't take points of each other in a lot of cases, and ended up playing finding opponents on lower scores (which isn't normal in swiss pairings). The other issue is that we award trophies for perfect score (7 wins from 7 games). In yesterdays event, it was looking as though I might have to hand out 10 such trophies, to players from the same school. Fortunately I was saved by Ricky Luo (Radford) who ended up playing all the top players from Lyneham High. Each round he was paired against someone on a prefect score, and each round he saved me one trophy! By the last round he had taken out 6 Lyneham players and as a result only Yizhen Diao and Manjot Melli ended up on 7/7. Despite his hard work Luo missed out on a perfect score himself, falling just short after a hard fought draw with Safron Archer in round 6. I observed a pretty wacky game of chess at my local club this evening. Black thought it was a good idea to sacrifice his queen, expecting to be rewarded with at least some compensation. However looking at the game from an elevated (and sideways) observation point I couldn't see exactly what he was expecting. I turns out that there was compensation, in that both players were under 5 minutes after about move 10 (60m+30s was the time limit), and in the ensuing complications, White ran out of time! I can remember at some point Nigel Short annotating a game where he basically said that the Two Knights Defence simply lost a pawn. This was based on the observation that after 4.Ng5 d5 5.exd5 Black cannot recapture on d5, unless they are willing to face the Fried Liver Attack. And yet people still play the opening, including myself, although I tend to give up more than a pawn in the lines I favour. Looking through some games from the current Abu Dhabi Masters, I came across a nice win for Black where he gave up a couple of pawns, in the Colman Variation. When I was a boy the advice was not to capture the pawn on c6, but White did, and Black demonstrated why it might not be the best idea. Nonetheless, the game was still pretty even until White decided to threaten mate on h7 with Qg6, at which point Black played a few checks and then trapped the White queen by moving his king. Albert Winkelman is another of Canberra's young players spending the European summer playing chess. At the moment he is taking part in the First Saturday IM tournament in Budapest. These monthly events have been running for over 20 years, and provide an opportunity for players to achieve IM and GM norms (depending on the section). While Albert looks to be finding this months tournament tough going, he has scored 2 wins, including one against IM Nhat Min To. So even if he doesn't return from Europe with a new title, he will certainly come back a stronger player. Unibet has just been announced as the official betting partner for the upcoming 2018 World Championship Match. Apart from providing you with the opportunity to win or lose money, Unibet is going to offer enhanced digital content throughout the match. Having never bet on chess before I'm not sure exactly what options will be available. Win, loss and draw for each game seems to be obvious, as well as betting on the match result. More exotic options could be problematic, as offering odds on choices of openings or specific moves could be vulnerable to insider information. More information will no doubt be released soon, but hopefully the connection of the tournament with a gambling site will not have any unfortunate side effects. While looking at some recent opening theory I came across the following drawing line in the Closed Sicilian. Clearly both players involved were happy to split the point, but I suspect the tournament rule on when draws could be offered/agreed to dictated the length of the game. Having said that, as the game was played after the FIDE 5 fold repetition rule came into play, then technically the game only lasted 16 moves. A slightly atypical win for me, played last night at Belconnen Chess Club. Whether I'm getting older, or finally playing the position rather than by instinct, is still unclear, but it was a fairly smooth win, with minimal chaos! The 2018 Chess Olympiad is less than 2 months away, and most federations have organised their teams. This years Papua New Guinea team has a few changes, including a return to the board for me. Returning from the 2016 team are FM Stuart Fancy, FM Rupert Jones and CM Helmut Marko. Joining them are myself, and newcomer Tom McCoy. Initially playing his chess in Canberra, work in PNG has allowed Tom to join the team. This year also sees a new team captain with US/Iranian GM Elshan Moradiabadi taking on the sometimes difficult task. Moradiabadi has some familiarity with the team, and Iran played PNG in the first round of the 2010 Olympiad, crushing me on board 2! The first round of the Olympiad is on the 24th September, with the tournament running through to the 5th October. Once again it will be an 11 round event, with a single rest day. ABC Radio in Canberra does a weekly segment on Canberra's "Secret Sports". This week it was Chess's turn to be the 'secret sport' so Alana Chibnall, Stephen Mugford and myself hit the studio to talk up chess, as a sport. The response was generally favourable, although of course there was at least one sceptic. You can hear the 20 minute interview here, starting at the 7:30 minute mark of the recording. After the interview Stephen Mugford mentioned a quick win he had at his local club. I'm always a fan of the quick finish in chess, so here it is. It is a good example of what happens if you move too many pawns in the opening, although ironically, it was Black who was finished off by a pawn at the end! I caught the movie 'Pawn Sacrifice' on TV this evening, having not seen it in it's entirety before. When I saw the initial trailers for the movie (when it was first released) I thought that the movie had made a reasonable attempt at historical accuracy. It turns out that 'reasonable' significantly oversells the accuracy of the movie. To be fair, it is a movie, and not a documentary, but almost every dramatic scene in the movie presented an alternative version of history. Venues were changed, opponents were different, tournament results altered, and even well known facts (at least to chess players) were sacrificed for dramatic alternatives. While this often happens in film, a lot of the changes seemed unnecessary, as the truth would have served just as well. As a movie I'd probably give it 6/10, but as a chess movie I would rate it significantly lower. There was a time when 'British' in the British Championship stood for the British Empire. Commonwealth players had the same eligibility to play as UK citizens, with the title occasionally heading off to the colonies. This eventually came to an end when an influx of strong overseas players made it seem like a Commonwealth Championship, rather than a English/Scotland/Wales affair. This years Championship looks to have done a great job of attracting most of the strong UK players to Hull. Fourteen GM's are in the field, including Michael Adams, Gawain Jones, David Howell and Luke McShane. Interestingly there are a number of non UK players taking part, but instead of being from India,Canada etc they are from various European countries. I assume that this is due to permanent residency/citizenship eligibility, rather than any ironic attachment to European Union work rules. Australia even has a representative in the tournament with soon to be GM Justin Tan. At the two thirds mark he is on 4/6, winning two games and drawing four. Adams and Jones share the lead on 5/6, and play in round 7. David Howell is half a point back, but has already played the two leaders (both games were drawn). Another player on 4.5 is GM Nick Pert who has had to work very hard, playing 3 of the 4 longest games in the event, winning a 90 move game, while drawing two others in 105 and 133 moves respectively. While I didn't mind my play on the first day of the 2018 ANU Open, the second day was a bit of a shambles. The 60m+10s time limit is a tough one to play, and if you don't have a clear cut advantage going into the last few minutes, bad things can easily happen. On the other hand the better you are, the less of a problem this seems to be. My first round game, against top seed IM Jame Morris, showed that winning tactics can be spotted, even at 10 seconds a move. Unfortunately for me it was my opponent who did the calculating, finding a nice queen sacrifice to finish me off.